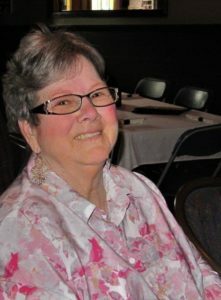 It is with great sadness that the family of M. Isabelle Kiesman announces her passing on October 7, 2018 at the age of 77 at Royal Inland Hospital in Kamloops, BC. Isabelle was born in Winnipeg Manitoba on March 25, 1941. She would meet her husband to be, Paul, at his mom and dad’s restaurant in Moosehorn Manitoba in the spring of 1956. They later moved to Regina where they married in January of 1960. She is survived by Paul Kiesman, her loving husband of 58 years and their son David(Ursela), grandchildren Jason(Tabitha), Alyssa, Nadine, Griffin, Drake, and Brianna . Daughter Cheryl (Keith,) grandchildren Angela, Lorien and Emmaly. Daughter Darlene(Craig), grandchildren Amber(Jon) Aidan, Emily. Bailey(Anthony) Robert. Son Darren(Suzanne), grandchildren Theresa(Dylan), Melissa(Ben). She leaves behind her sister, Margaret(Paul), her brother Donald(Lyla), and her sister in laws, Suzy, Glenda, and Linda. A Celebration of Isabelle’s life will be held at 2:00 pm on Saturday, October 13, at St. Andrews Lutheran Church, 815 Renfrew Ave, Kamloops, BC. Isabelle’s beautiful smile, witty sense of humour, and compassionate soul will be dearly missed and will always be remembered by her family and friends.